As of this October 2018, Eurocom offers the much-anticipated Intel 8 cores, 16 threads i9 9900K and 8 cores, 8 threads i7 9700K processors in addition to the current line of 6 cores, 12 threads Intel CPUs such as the i7 8700K processor. All of Eurocom’s Sky “C” series models are based on the Z370 Intel chipset and are using CPU-upgradeable, LGA1151 socket-based processors. Therefore, they are capable of upgrading to 8-core and 16-thread CPU’s once they are launched. 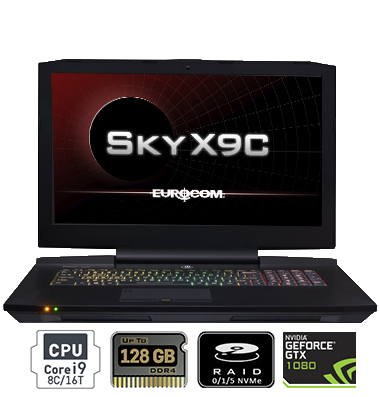 Along with this, Eurocom is excited to announce that all of its Sky “C” models are capable of supporting up to 128 GB of RAM (4 x 32 GB DDR4), catering to memory and power-hungry users who desire higher performance in their laptops. The EUROCOM Sky X4C, X7C and X9C systems are available for 9900K and 9700K starting today. All of the existing Sky “C” models are upgradeable to i9 9900K and i7 9700K CPUs with BIOS updates that Eurocom will release to all of its customers. The new CPU options add more choices to the already limitless possibilities when customizing your laptop. This opens the door for your dream system whether you are a designer, multimedia content creator or a serious gamer. You can now build the laptop of your dreams! 17.3” EUROCOM Sky X7C is available with choices of different LCD including UHD/4K (3840x2160), QHD (2560x1440), FHD (1920x1080), 60Hz or 120Hz. Eurocom laptops are fully-configurable to meet the specific requirements of different applications and operations with the goal of maximizing each user’s performance and productivity. Please refer to links provided on this page for specifications, pictures and relevant information about these models. 1. Choice of LCD sizes: 15.6", 17.3"